Often, the objective of a game is to have as much fun as possible. GTA, Skyrim, Fallout, these games are all about letting you do all manner of crazy sandbox stuff. However, Party Hard was a game that was about the total opposite, namely stopping someone’s fun. The premise was fairly simple: it’s 3 AM and you need to sleep, but you can’t because of a party nearby. You need to go to the party and disrupt it using as much creative violence as possible. Of course, the game isn’t about brute force per se. You use your wits to create a number of ‘Home Alone’ style traps that end up killing and maiming your intended victims. Well, Party Hard 2 finally has a sequel. Does it bring even more brutality, or does it rehash the old ideas? Well, for starters, the levels in Party Hard 2 are actually pretty big and open, and there are lots of different ways to dispatch your victims. Now I should mention that I’m assuming many of you haven’t played Party Hard 1, so much of my review of Party Hard 2 will be a fresh perspective to the series. In terms of gameplay, each stage in Party Hard 2 involves you moving around the level to find your enemies and also to find environmental threats you can use to dispatch them. You pretty much just start with a knife, but you can pick up other weapons and items and you can even craft some new ones, which is surprisingly useful. Everyone’s in party mode, so you can take advantage of empty rooms and try and corner people using stealth, or you can rig a jukebox to blow up when someone walks past it. Overall the game offers you a ton of different ways to complete objectives, and it does tend to reward quick thinking. It’s reminiscent of games like Hitman, but I would say it’s a close cousin to a lesser-known title called Neighbors from Hell, albeit with a more open-ended level design. Levels are reasonably varied in terms of structure and challenge, but you will find yourself repeating a lot of classic moves. There are two boss fights, however, which definitely gives a sense of variety. In terms of scoring, you get points for completing level objectives and of course for using more stylistic ways of ending your victims’ lives. Obviously, the emphasis is on stealth here. However, as a stealth game, Party Hard 2 has major logical inconsistencies. You really only need to avoid being seen murdering someone. There’s very little in the way of a suspicion meter, and while you do raise the alert level a bunch everytime you kill someone, it’s not something that’s dangerous for you. On the flipside, sometimes you’ll get caught for doing virtually nothing. Getting good at the game is really about understanding this weird internal logic. Additionally, even with suspension of disbelief a lot of the elements of the game feel nonsensical. For starters, setting off an explosion only mildly disrupts the partygoers, so you end up in a situation where you murdered a bunch of people and the party plods right on. In a sense, this may be a commentary on the sick nature of the party culture and its lack of regard for human life. However, it’s more likely that this is the result of lacklustre AI. The game does have plenty of commentary on the ugliness of party culture. The game has a Hotline Miami-esque storyline where you delve deep into the mind of the Party Hard killer. The game’s events take place 10 years after the events of the first Party Hard game, and at this stage, the Party Hard killer has gained a reputation as a notorious mass-murderer. Of course, I say ‘Hotline Miami-esque’ because the game does show us the perspective of the killer. He’s not a particularly sympathetic figure actually, and I think the game lost something by giving him a script. Making him quiet like other notable game characters would have lent it more mystery. The game’s storyline is actually nicely structured, however, and the events all build up to a big TV interview discussing the Party Hard killer which, you guessed it, becomes the game’s finale. I would say there’s a definite case of ludonarrative dissonance here, as the game’s dark cutscenes contrast pretty sharply with the wacky violence and cartoonish traps. As a sequel, Party Hard 2 plays it a bit safer. When comparing to the first title, you can tell that a lot of the core structure is there. There’s a co-op mode in this one, which is okay overall but doesn’t really shine. Additionally, you have new characters to unlock with their own abilities, and I actually liked seeing these guys in action. However, Party Hard 2 still manages to be a game that rewards patience and stealth, even if it’s a little rough around the edges. 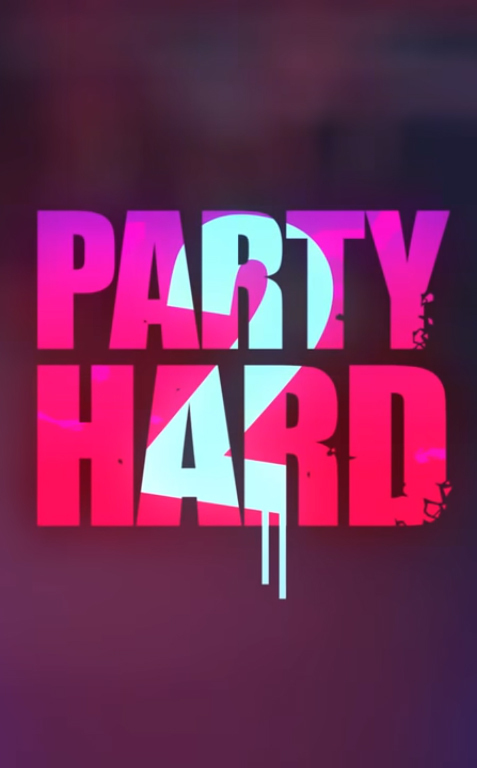 Party Hard 2 was reviewed using a PC downloadable code of the game provided by TinyBuild Games. The game was tested on a machine running Windows 10, with an 8GB NVIDIA Geforce GTX 1070 fitted on a 4th Generation Intel i7 4790 3.6Ghz CPU and topped with 16GB of RAM. We don’t discuss review scores with publishers or developers prior to the review being published (click here for more information about our review policy).